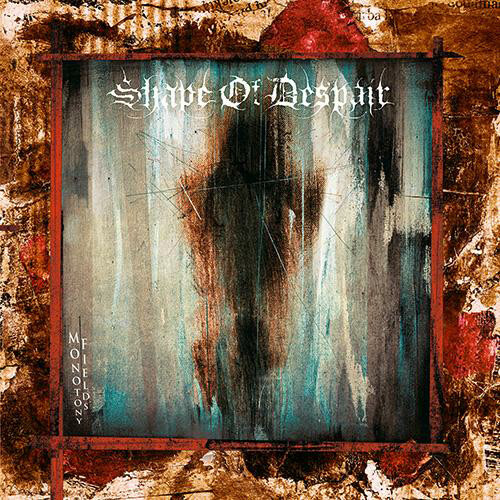 Shape of Despair is, along with Skepticism, one of the bands that introduced me to funeral doom. They’ve remained one of my favorites, and as there’s very little variation in both quality and style within their prior three albums, and as they’ve released almost no new music in the ten years that I’ve been listening to them, I’ve come to see them as being not only consistent but actually static. Whenever grey skies roll in and I find myself in the mood for some lush, melancholy funeral doom, I select from their albums and songs almost at random, and the experience is largely the same regardless of what I land on. A consistently rich experience, but always predictable. I’m both relieved and disappointed to find that Monotony Fields will not change this scenario in the slightest. Everything I want from Shape of Despair is here: the lush pads, the sad, gentle keyboard melodies, the roaring vocals, the quiet interludes followed by volcanic drops. There are a few new sounds, mostly in the clean male vocals and some of the keyboard sound design choices, and it’s all very welcome but also well-contained within the band’s established paradigm. I’m most pleased to see that their approach to harsh vocals, one of my favorite elements of their earlier albums, is still intact after a lineup change. Like former vocalist Pasi Koskinen, Henri Koivula’s growls are deep, steady, and dominate the mix without overpowering it. His approach even has a melodic quality, following the chord changes, landing the lowest notes in all the right places. All of the content–all of the melodies, all of the chord progressions, all of the vocal lines, all of the lyrics–are enjoyable in themselves and within the context of individual songs, but across the album’s full 75 minutes, the consistently invariant textures, rhythms, tempos, and melodic palettes become, well… monotonous. Of the eight songs, all are in minor, all use the natural minor scale (at least shifting key from song to song), all but “Written In My Scars” are entirely in 4/4 time, and all but “Descending Inner Night” land very close to a 25 or 50 beats-per-minute tempo. Variations in the drum beats, the chord progression and vocal rhythms, and the song forms from song to song are subtle at most. Given the title, it seems that this approach may be exactly what they intend: a constant, thundering, melodic field of monotony. I have yet to listen to the entire thing in one sitting; my initial excitement is always there whenever I press play, and it always wanes after about 40 minutes. At some point I’d like to sit and listen to this album in full with nothing else to focus on, almost as a meditation. For the time being, listening to two or three songs at a time is always enough to be enjoyable and leave me wanting more, and with the sheer quantity of quality content on this album, I know there’s always more to come back to.